This winter I seemed to have become lost in a powder-filled dream; where one day blends into the next, and where the epic days of November seem like years ago, while particular moments are burnt into my memory as though they happened yesterday. To say the B.C. coast had an amazing snow-year would be an enormous understatement. Up until November, our mountains were bare, and I struggled to put the thoughts of skiing powder deep in the back of my mind, while I focused on pounding out the last month of carpentry. I never finished that last month of work, as winter came in like a lion, dumping 3 meters of West Coast’s finest powder within a couple weeks. 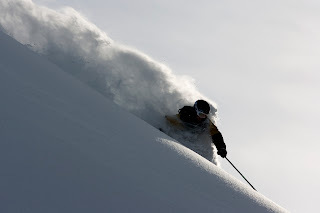 Whistler opened November 18th with a deep, stable snow-pack right from peak to creak. Blackcomb opened shortly after and the season was on! My typical November/December normally involves tiptoeing around rocks and stumps and regaining my ski legs and mountain awareness. This year though, there was no tiptoeing, as the amazing conditions allowed me to charge hard every day. With the short dark days of early winter, and forecasts of continuing storms, there were not many photo opportunities until later in the season. On rare occasions when the sun did peak out I took advantage and teamed up with local photographers: Damian Cromwell, Bryn Hughes, Eric Berger, Chris Christie, Russell Dalby, and Andrew Bradley. In addition to freeskiing, I also did some guiding for Extremely Canadian tours on Whistler/Blackcomb. This was a cool opportunity to take intermediate/advanced skiers to off-piste areas that they wouldn’t normally ski, and give them some tips on skiing techniques, snow safety, and all around mountain awareness. It was also a good opportunity to update the clients on the best gear to use when dealing with the unforgiving mountain environment. Teton Gravity Research (TGR – one of the top producers of ski flicks) finally realized Whistler’s potential, and based a cinematographer here for the winter to shoot a few locals. Ian MacIntosh recommended me to the producers, and before I knew it, an old pipe-dream had come to be. The last week in January, it rained in Whistler, as it does on the coast, so Dana Flahr and I loaded our sleds on his truck and a borrowed trailer, and headed to Revelstoke for my debut in front of TGR’s 16 mm lens. Our filmer Rick was a day late and a dollar short, so Dana and I headed off in the early afternoon of day one, with no real knowledge of the area, in search of my brothers and fellow Whistlerites. We managed to find the boys, and scope out a zone that we returned to the next day with Rick. It was still too early in the season for the North facing lines with the best snow, so we spent the rest of the week exploring other zones and skiing sun and wind effected snow. After two blown trailer tires, one blown axle bearing, one late night sled rescue mission, eight broken ski poles, countless emptied beer cans, and multiple beaters on hard packed snow, we returned home to Whistler where it had began to snow again. 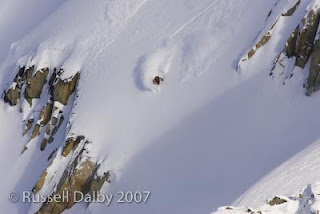 I was home long enough to ski some pow, and rest up before heading to the Red Bull Cold Rush in Rossland, BC (Feb 9-11). This event involved 23 selected skiers from around the globe to compete in three different disciplines: ski touring, big mountain, and jibbing. Day one went well, and I finished in 4th place in the ski tour race up the 2500 ft. Mt. Roberts. Day two never happened as the snow had a thick rain crust that no one was willing to charge on. Despite the unconcluded competition, we all had fun skiing Red Mt., then getting rowdy at the after party. The $10 000 purse is still up for grabs for next year …. It was back to Whistler again for another week of sled-skiing as I filmed with TGR. I then packed up my sled with ski gear and headed north; first by truck past Pemberton, then by sled over the 50km pass to Braelorne. I rode through the half deserted mining town to the lodge, where I found a note from my bro Dan, saying where he and fellow skiers Cody Townsend, Kaj Zackerson, and Jon Urorback were filming with Wink Inc. Productions. With the clouds breaking I gassed up the sled and ripped over another 25km of bumps to meet up with the crew. The snow was perfect, but clouds had rolled back in. We bagged some great pow. with fun airs then headed back to the lodge for a well deserved meal. The 175km day of mainly sledding, some driving and skiing a few lines took its toll, and I was down for the count by 10:00. 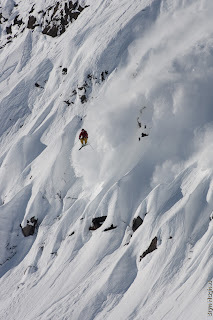 Through out the week we were able to ski some fun lines with pillows, pow, airs, spines, chutes and exposure. One the weather days we taught the Sweeds how to ride the sleds, and they did surprisingly well for a couple amateurs. We also found the old three story brothel and built a jib off the wall. Fun times for a bunch of big mountain skiers. By the time I had to leave I had lost sense of the days and months, and was very used to the routine of wake up at 6:00 to check the weather, have breakfast and coffee, fuel up the sleds, gear up and head out, ski and sled until we’re out of gas, rip ‘home’ for dinner, beers, stories, movies, whiskey, and sleep. From Braelorne I ripped back over the 50km pass, loaded the sled in the truck and hammered for Whistler where I met up with MacIntosh, continued past Whistler, unloaded the sleds, and ripped up into one of Whistlers many sled zones. We planned on filming with TGR, but once again our filmer was MIA, so we took advantage of the bottomless pow. and rooped the sleds until we were again on empty tanks. I think I am getting used to this lifestyle. The remainder of the season was spent in the Whistler area living the life of a skier … skiing Blackcomb on the morning of powder days, then rooping the sleds in the afternoon, or simply sled skiing day after day. The majority of days were spent filming with TGR, and shooting with local still photographers. I explored some new zones where we ski toured into a cabin, then skied lines around the cabin. Despite the exhilaration and ease of access when sled skiing, I still appreciate ski touring … the physical challenge, the solitude, the quiet, the deep and untracked pow…. Just as I thought my ski season was done (my sled blew up and I lost my pass for the last month of the season) I found myself scrambling to get my gear together and race to the Pemberton heli-pad. PY Leblanc had arranged for a photo shoot with myself and the rest of the Chlorophylle team. Guy fired up the bird and we headed to some peaks close to Pemberton, warming up on a 1000 ft face, then hitting the renowned Sun God. This was the run of my season. Landing on the ridge was by far the most exciting, as either side of the ridge drops off 2500ft. I finally felt safe again once I had my skis on and was standing on top of a long exposed spine with perfect snow. Each turn was critical as this run was definitely a no-fall zone. As I skied safely out my exit, I could see the snow cascading off the 150ft. 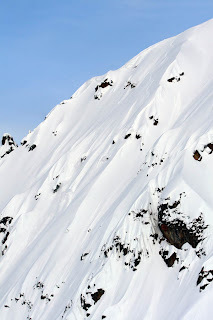 cliff that I was skiing above; what a feeling – a great way to end the season and keep me stoked for next winter.